Tulloch Castle, the ancestral home of the Chiefs of Clan Davidson, is located on the outskirts of Dingwall, Scotland, in the county of Ross and Cromarty, or Ross-shire. Dingwall is a little town that has played an important role in the history and leadership of the Highlands. Norsemen probably built Tulloch Castle around 1166, but all that remains of the original structure are the southwest corner and its tower. It was first called Tulloch in 1507 from the Gaelic word "Tuich", which means "hillock". Four chief families have been especially active in the town of Dingwall and country life. They are the Baynes, (later intermarrying with the Davidson’s), the Dingwalls, the MacKenzies, and the Munros. Bayne (or Bain, MacBain or MacBean) are first recorded as being in Dingwall in the late 15th century. Their origins go back to Donald Bane of Malcolm Canmore’s reign, and James Bayne, Bishop of St. Andrews, crowned King David II at Scone. The first Bayne of Tulloch was Duncan, who received a charter from King James V in 1541 giving him the lands of Tuich or Oulch (later Tulloch). In 1553 he acquired from Clan Munro the lands of Davochcrate (now Dochcarty), which adjoined Tulloch Hill lands. A road was built between the two castles (Dingwall and Tulloch) but the Dingwall Castle is gone and only Tulloch survives. Kenneth, the eighth Bayne of Tulloch, sold the estate to his cousin, Henry Davidson the chief of Clan Davidson, on the 13th of January 1762. Duncan Davidson, 4th laird of Tulloch, was born in 1800 and became Member of Parliament for Cromarty in 1826. He was one of the few lairds of the period to always dress in Highland garb and was a great favorite of Queen Victoria's whom he used to drive personally on her visits north. In his capacity as Lord Lieutenant of Ross he was her representative in the area. He was known locally as "The Stag", having had five wives who bore his eighteen children and he had at least thirty illegitimate children around the district. One of his wives was the youngest sister of his daughter in law. One of his daughters was to become the famous Green Lady of Tulloch. He is also remembered for being the subject of one of the famous predictions of the Brahan Seer - "The day will come when there will be a Laird of Tulloch who will kill five wives in succession, but the fifth will kill him." Interestingly, Duncan died of pneumonia in Edinburgh after attending the famous Wet Review of volunteers by Queen Victoria of 1881, and was survived by his fifth wife. The last of the direct line of Davidson at Tulloch was Duncan Davidson who died in 1917. His daughter inherited Tulloch Castle and her son, Colonel Angus Vickers, of Vickers Aircraft, was the last owner of Tulloch lands before they were given to the Highland Regional Council just a few years ago. Since then the Castle served intermittently as a dormitory for Dingwall Academy before converting to its present use as a hotel. In 1920 the castle, which was falling badly into disrepair, was completely renovated by Mr. and Mrs. Vickers. The roofline was changed and it was completely modernized. In her later years, Colonel Vickers’ mother did not live at the castle but preferred her smaller apartment at the adjoining farm complex. Ken and Margaret MacAulay with their family Emma and Kevin purchased Tulloch Castle in August 1996, their mission statement being – To build up Tulloch Castle Hotel into an efficient and profitable business, characterizing the best of Scottish traditional hospitality and food, in a welcoming, family-run business. To preserve the history of the castle and make it accessible to local people as well as visitors. The purpose of building this model was for display in our Clan Davidson tent at our region 7 highland games, which primarily include Virginia, Maryland, and Pennsylvania. Before construction began the usual research was necessary. For example we were forced to go to Scotland and stay in the castle, which just happens to be a great hotel now. The price of research! We had stayed at Tulloch a number of times since the present owner Ken and Marget Mac turned it into a hotel. While the interior needed a lot of work because of its run down shape the exterior was not too bad. Ken has made a dedicated effort not to change the castle any more than necessary to bring it up to current living standards. On our last trip in May of 2002 while staying at the hotel we took over 180 digital photos for this project. When we returned home I went over the photos and started the scale drawings. I was not sure until I started what scale it was going to end up as. Unfortunately I had no way of measuring the castle when we were there so I had to use an Ordnance Survey map of the castle completed in 1904 to base the floor plan on. The castle had gone through numerous changes over the centuries but the last major addition was in 1930 when a third floor was added. I decided to use this as my date for the model since it had not changed much since then and the decedents of the Davidsons still owned the castle at that time. The drawings were completed on a computer using Corel Draw. It took a lot longer than expected because of the complicated layout of the various parts of the buildings and the lack of a good overhead view of it. The 22 separate drawings were finally completed after about 2 months work and it was time to start the construction. As I mentioned I really did not know until I had completed the main plans what the final scale of the model would be. Luckily it work out to be what is called HO scale or 1/87 scale. The reason this scale work well was because that is the most popular model train scale. This meant there was a number of items I could take advantage of including a large selection of windows and door frames in plastic, which would not only save considerable time in construction but also added to the realism of the model. Additionally, this would allow me to use HO Scale figures and animals to add life to the castle. For most of the construction material I used various types of sheet styrene or plastic. There is a wide variety of this material available to include surfaces of brick and shingle roofs. I built the castle in modules or sections. I started with the keep including the tower. The tower was made from a 1" diameter PVC pipe covered with brick surface styrene. I then made each wall by first cutting out the windows and doors openings. The frames for all the doors and windows were from a California company called Grandt Lines. These frames are widely available from most model train stores. After the walls completed they were glued together and a roof added. For the keep and tower which both have flat roofs I glued on sandpaper to simulate the tar and gravel roof of the real one. For the sections that had angled slate roofs I used strips of styrene to form the roofline and glued the styrene slate shingle roofs on. The gables were formed from more roofing pieces and the window frames were glued in. When all the sections were completed I glued the five sections of the front part together. The rear section consisting of 3 buildings was glued together forming a "U" shape but not glued to the front part yet to make painting easier. 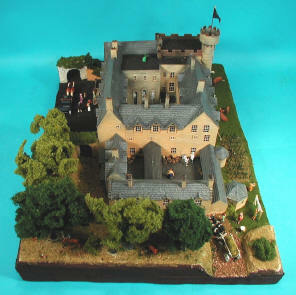 The castle was then airbrushed with acrylic hobby paints called Tamiya. I first sprayed a dark gray all over the outside and black on the inside. I then lightly sprayed with a light yellow color for the walls and dark gray for the roof. A wash, which is a mix of mineral sprints and a little black oil paint, was applied to better define the brick walls. The window frames were painted white and the doors a gloss green enamel. The last step was to dry brush with oil paints. Dry brushing is putting a little oil paint on a brush and wiping it off till only a little will come off when you lightly stroke the model. This produces a very realistic highlight effect. I used primarily white and yellow ochre oils for the walls and black and white mix for the roof. After everything had dried I took clear acetate sheets and glued them inside the walls for window glass. A flag was made from a plastic rod with a small brass covered plastic bead. The last step was to glue the front and back sections together. A company who specializes in model train scenery called Woodland Scenics makes all the base materials I used. The main base was made from a large sheet of 1" thick styrofoam purchased at a train store. This foam is the kind used to make train layouts. I then added sections around the side and back to represent the hill the castle is located on. I then covered the styrofoam with plaster-impregnated cheesecloth being careful to leave a flat area for the castle. I then glued to castle on the base. Using very thin white glue as a base I sprinkled on various grasses and dirt for the roads and lawns. The trees around the back were made from a kit for model trees, which uses soft metal armatures, which you bend to shape and paint. The leaves were then glued on using white glue. The main entrance is an N Scale model railroad tunnel entrance. N Scale is smaller than HO. For the main drive I used black gravel, which is what it is covered in today. From what I could tell from the old map and photos there was a garden on the west side of the castle where there is a parking lot today. To make the garden I formed these rows when putting the plaster down and used dirt to cover it. I used very thin brass plants, which I first painted then planted. I then populated the castle with a number of figures to give "Life" to the scene. Most of the figures and animals were used as bought but a few needed alteration. I modified a gentleman with a long coat and hat into the clan chief by removing his pants and using putty made him a kilt and sporran. Cutting the brim off and adding a feather modified his hat. The highland coos were modified from regular cows by putting putty on them and then teasing the putty to give a long hair look. Also the horns were made from thin wire since highland coos have longer horns than most domestic cows. Once the model was completed and measured I ordered a special Plexiglas case with base to put the model into. This is necessary for several reasons. First it protects the model from dust but most importantly it protects if from stray fingers at the games. The whole project took about four months to complete and entailed a lot more work than I at first anticipated but I feel the results were more than satisfactory. 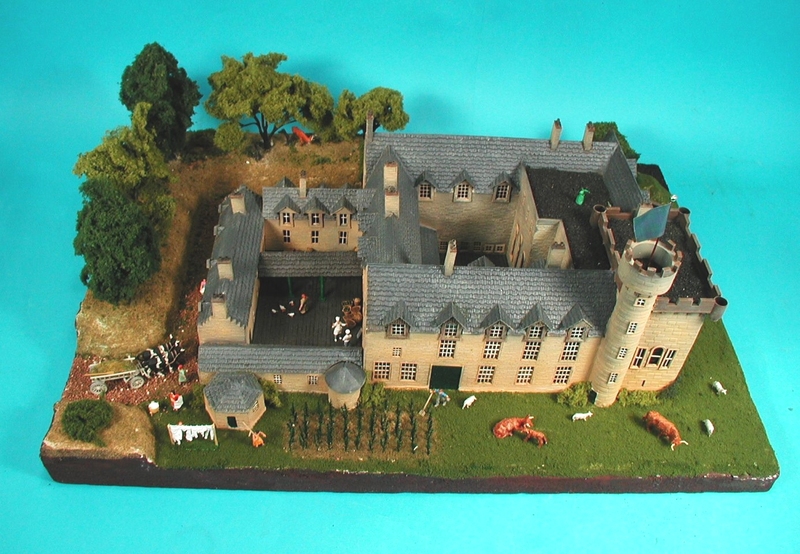 One word of advice is if you plan to do a similar project with your clan castle or ancestral home and show it at games don’t just build the model but add the figures. I made a point of finding as many types of animals I could find around the model. This includes deer, dogs, cats, sheep, highland coos, rabbits, peacocks, ducks, chickens and geese. The reason to add all of these animals is because it gives the wee ones something to look for although I think most 3 year olds think the highland coos are just big dogs.